One could not begin to ask or dream of a more glorious weekend to stage the annual Riverwalk Fine Art Fine, which is sponsored by the Naperville Art League (www.napervilleartleague.com). The reasonably crisp Autumn temperatures combined with cloudless sunny skies had us all wanting to avoid being indoors. We’ve devoted allot of time and attention to the interior of our house this summer and among the finishing touches has been the expansion of our original art collection. As you can imagine, given my deep love and passion for the arts, this weekend arrived with great anticipation. Aside from stopping off for a delicious lunch at Tessa’s (review to come), we ended up spending a total of four hours browsing back-and-forth along the Riverwalk and Jackson Ave narrowing our selections while navigating crowded narrow passage ways. Since my wife drove the selection of the piece we purchased earlier in the summer at the Naperville Fine Art Fair, it was my turn to take the wheel in the selection process. As it may come as no surprise to my loyal readers, I love paintings rooted somewhere between realism and impressionism with a focus on architecture and life in small towns and big cities. My favorite artist of all time is Edward Hopper (1882-1967) who was best known for his soul-searching depictions of contemporary American life. For anyone who has visited the Chicago Art Institute, you will likely recognize perhaps his most famous piece “Nighthawks”. 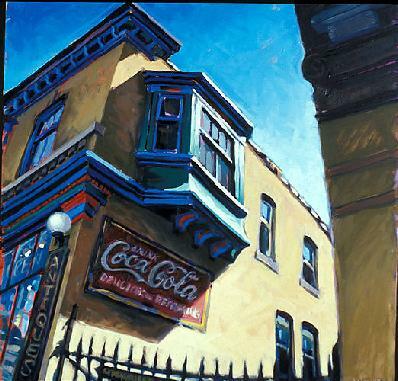 Thus, for me I always have my eye out for artists that venture somewhere in the general direction of Hopper. This year, I found two artists which I admire greatly. The first was Milwaukee-based artist Shelby Keefe (www.studioshelby.com) who focuses on oil paintings and identifies herself as a contemporary impressionist. I must admit that her entire collection was love at first sight for me and I hope to eventually own a couple of her pieces, which at the present time were just a bit beyond our budget. Nonetheless, please visit Shelby Keefe’s website and please support her considerable artistic talent. Below is a good example of her work which I found on her website. Though we came very close to making Shelby’s “Corner Store” piece our official selection, we also discovered the work of Rolling Meadows-based artist Joe Ruck who uses a brayer (roller) to create his unique style of art which consists of (and sometimes combines) paintings, sculpture and drawings. 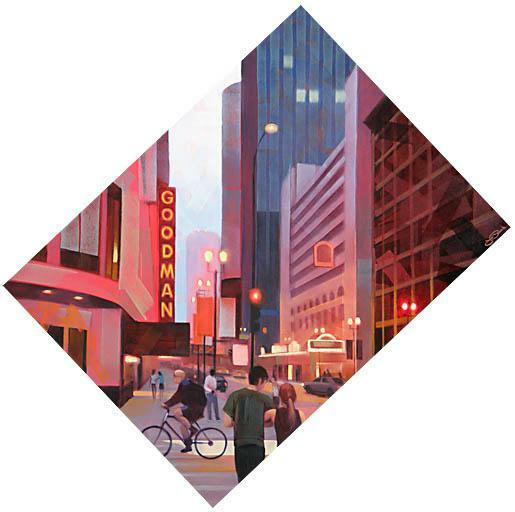 As Joe may recall, we made many trips back and forth to visit his booth as we were very drawn to an alluring piece entitled “Street Theater” (first image above) inspired by the Goodman Theatre in downtown Chicago. The piece itself was painted diagonal on the canvas which really adds an interesting perspective to what was already an engaging painting. I’m thrilled to report that we purchased “Street Theater” and it’s vibrant amber hues are already gracing our family room wall. Even more, we are amazed by how the painting seems to almost come alive once the sun goes down. Though the work of Shelby Keefe and Joe Ruck were my favorites, there were a multitude of extremely talented arists from all over the country displaying and selling their work. To each of them, I hope that it was a successful weekend. In addition, perhaps saving the best for last, there was a strong showing of local Naperville artists in the Naperville Art League’s booth and at some point I look forward to getting over to the Art League’s local gallery at 508 N. Center Street for a future selection (www.napervilleartleague.com). I will be the first to admit, I have not always been a big fan of the Carillon. Partially, it has to do with the years in which the instrument and missle-like structure sat incomplete and seemingly abandoned. Then there were the days of intense public debate over the future of this most visible community feature which at one point placed into question whether or not the instrument and structure should be dismantled given financial difficulties. Finally, as a musician/composer who explores a myriad of music genres and plays a number of instruments in creating music for independent film, I’ve struggled to develop an appreciation for the tonal qualities of the instrument. Today, I’m pleased to report the Carillon has finally touched my soul. After a morning of baseball, football and soccer at Rotary Hill with my three-year old, we walked over to the base of the tower. As he glanced upward at the intimidating structure, I explained to him the aspects of the instrument pointing out the larger outer bells resting within the tower. Unfortunately, we weren’t able to stick around for tour hours, but I certainly plan to take the boys to tour the Carillon soon. I must confess today was the closest I had gotten to the Carillon since the final phase of construction was completed, despite the fact we make many trips to Rotary Hill. Nonetheless, I must say the finished product is truly magnificent and now a complete landmark reflecting the uniqueness of our community. Even more, I am actually finding some of the music to be rather pleasant. I guess the reason I’ve struggled to enjoy the sound of the instrument is the fact it’s overall tonal range seems to be stuck in a minor key which places a strain on pieces of music written in a major key. Clearly, certain pieces of music sound better than others and I find myself enjoying performances of songs that are well-suited for the instrument. Regardless of whether or not you care for the sound of the instrument, it’s hard not to appreciate the uniqueness and scale of this particular Carillon. According to the official Millenium Carillon website (www.naperville-carillon.org), it stands at 14 stories (160 ft.) and is slightly taller than the Statue of Liberty (151 ft.). With a total of 72 bells, the Millenium Carillon is among the largest of its kind in the world. Admission is $3.00 (kids under 5 are free) and you climb from bottom to top via a staircase. 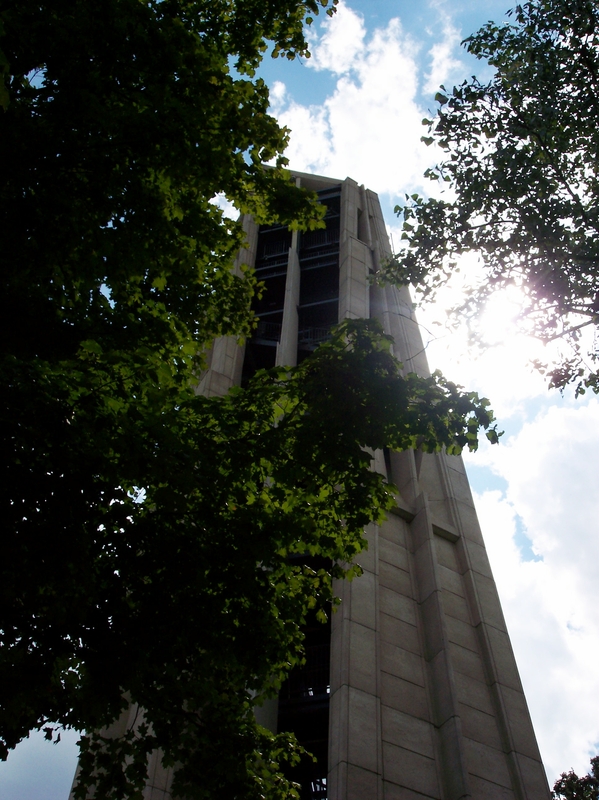 The Carillon is equipped with an elevator which will take you half way to the top, but still requires a few more flights to ascend to the top observation deck. In the near future, I plan to go up for a visit and take some photographs as well as shoot some video of the view from the top which I plan to post. 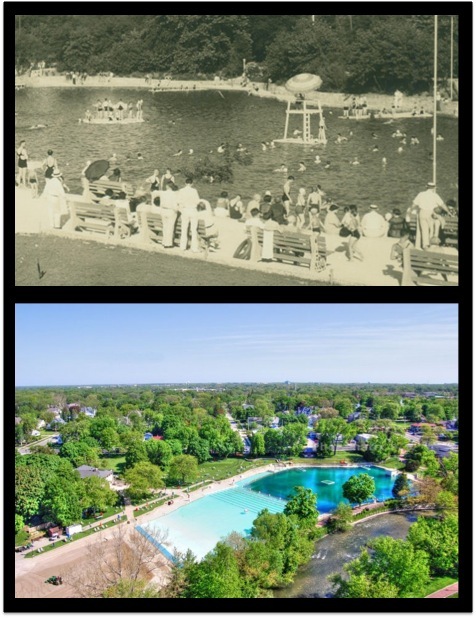 Kudos to the many Naperville residents and leaders who worked tirelessly and transcended plenty of adversity over the past 9 years to see their vision become a reality for our community. Your hard work and conviction has truly paid off and future generations of Naperville residents are indebted to you for the gift of this proud icon. While we can all breathe a sigh of relief that the waters have receded from the lower portion Riverwalk after a week of rain, it’s amazing to see what this Naperville landmark looked like just a couple of short days ago. For those who did not venture downtown over the weekend, here’s a video montage of what you missed. 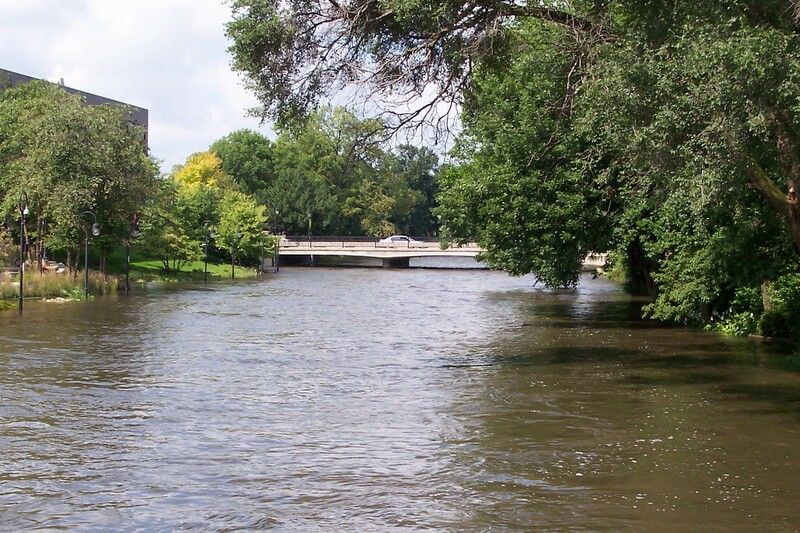 After a week of rain, severe thunderstorms and subsequent flooding, the Riverwalk in downtown Naperville doesn’t quite look like itself today. My son and I spent a sunny afternoon today in downtown walking along the waterlogged Riverwalk and watching the rushing waters of the DuPage River reclaim a portion of the scenic path through downtown as the river rises. 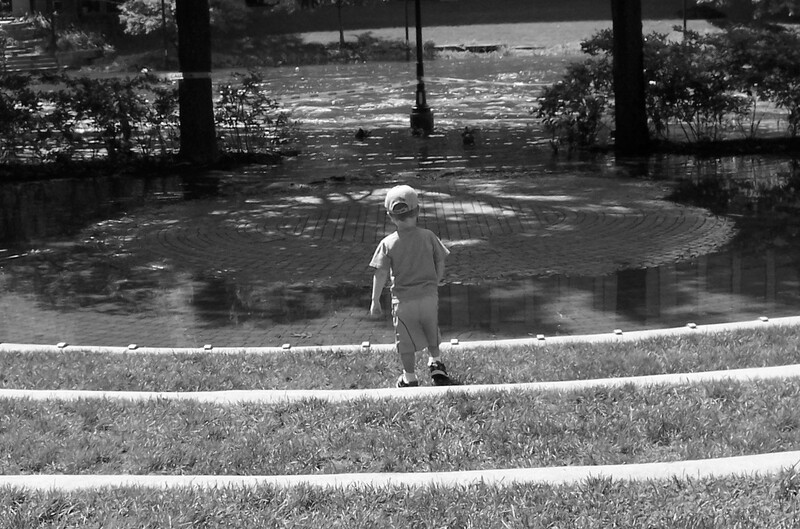 As you can see by the picture above, my son didn’t quite know what to make of the situation as he is used to running in endless circles around the Riverwalk’s outdoor ampitheater. Below you will find a series of pictures I took which will give you an idea of exactly how much the river has risen over the past couple of days. In addition, I captured quite a bit of video which I intend to edit and post as still pictures don’t quite do justice to the extraordinarily fast-moving rapids of flooded DuPage river. To those of you who have read my previous postings about the Riverwalk, I couldn’t help but show what has become of my favorite spot to relax and read. Notice how close the water has risen underneath the Eagle Street bridge. Also, look along both banks of the river and see the submersed lightpoles along the Riverwalk. The good news is at least the water has not reached the city building. 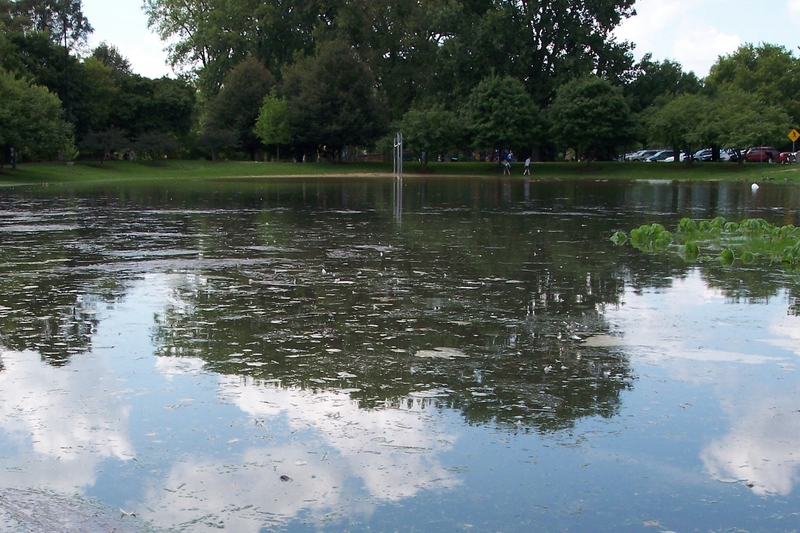 The sand volleyball courts between the skate park, baseball fields and Jacycees playground has become a reflection pond. If you plan to bring your children down to see the spectacle while the Riverwalk is still flooded, I encourage you to be extremely careful as the water is deep and swift moving. 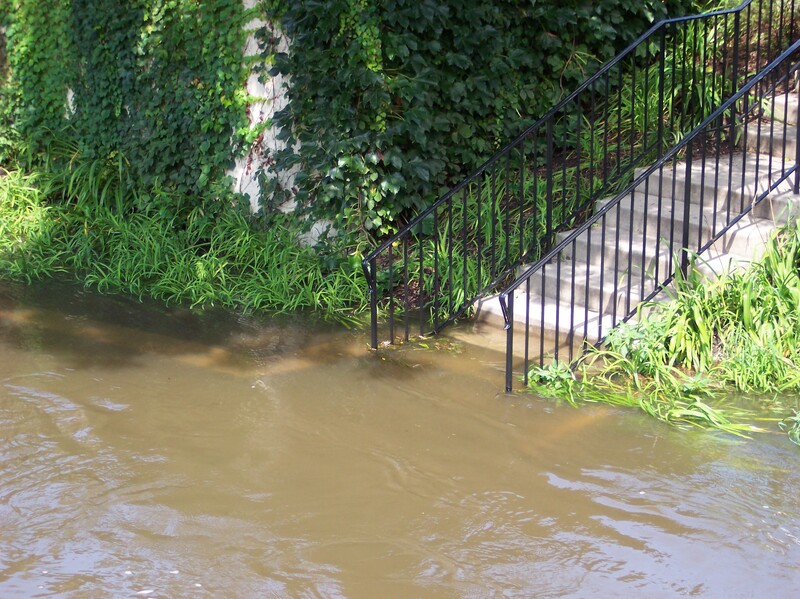 Even more, the manner in which the DuPage has crept up onto the banks could had brought it dangerously close to the main Riverwalk path. An accidental stumble down the shortened hill could sweep anyone into the waters. Again, be very careful. 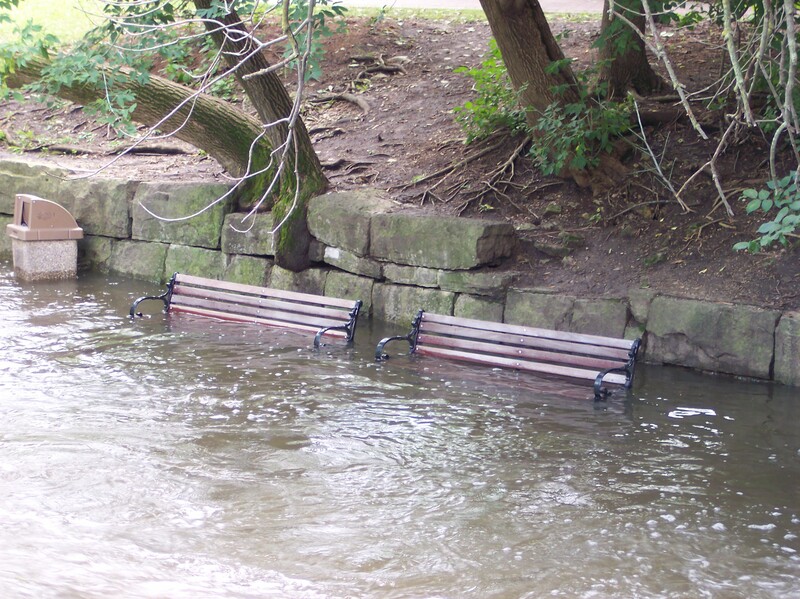 Though our hard-working City of Naperville crew will have a mess on their hands once the water recedes, the Riverwalk should be back to normal in no time at all. Based on stories I’ve heard, this is certainly not the worst flooding the Riverwalk has seen. To our city crew, we send our deepest thanks and appreciation in advance for the work ahead. If you haven’t already noticed, yet another sign of Spring has sprung in Naperville as the Dandelion Fountain has been re-installed along the Riverwalk at the corner of Jackson and Webster. To me, this fountain is a Naperville icon which symbolizes “community”. The circular symmetry between the fountain and the fountain’s setting provides an area where people of all ages and from all walks of life can pause to relax and socialize. In my mind, the symmetry is perhaps a reflection of our own world which bonds us all together utilizing the energy source of water as the focal point. To my kids, it’s a great place to conduct water splashing experiments. 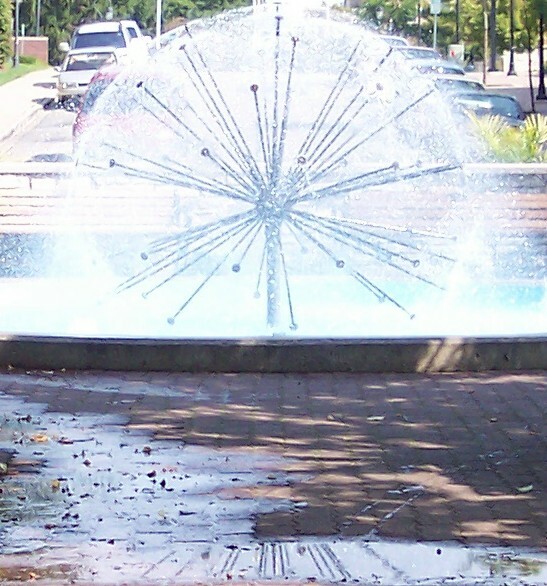 Regardless of your own perspective, there is certainly a sensory experience elicited by the Dandelion Fountain which reinforces Naperville’s strong commitment to community. As the warm weather moved through Naperville this past weekend, it may come as no surprise to anyone that I headed down to the Riverwalk with the family for a long stroll culminating in a regular visit to the wonderful and relatively new playground just west of the Centennial Beach parking lot. As we walked, visions raced into my mind of the rare opportunities I get to come down to the Riverwalk for a little solo soltitude all to myself. For those of you with multiple young children, you know what I’m talking about. 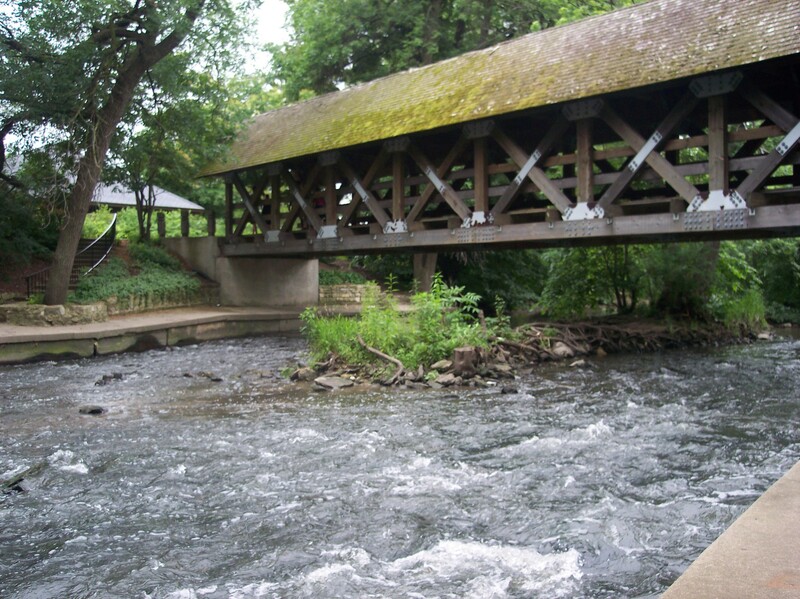 Along the five mile stretch of the Riverwalk, there are many quiet places to sit, reflect, read or perhaps even doze off for a few minutes with the tranquil rushing waters of the DuPage River serving as a relaxing background. While you can’t go wrong with any of the peaceful nooks or well-placed benches, my personal favorite is sometimes missed by those who may not frequent the Riverwalk as it is slightly of the beaten path. Just as you come across the covered bridge which leads to the paddle-boat quarry and Rotary Hill, turn to your immediate left after walking off the bridge and there is a set of stairs which leads down to an isolated landing which includes a couple of secluded benches close to the water. The location is ideal as it gives you a terrific view of the covered bridge traversing over the River as well as a small island in the center of the river which serves as a soothingly audible break-point for the rushing waters. To your right, you can see the bend of the river heading in towards Downtown. This is one of the few nooks along the Riverwalk which is not connected to riverside path which runs on both sides along the water. As a result, there is no foot traffic passing by, just the occaisional curiosity seekers who make their way down the steps for a quick inspection before continuing with their exploration of the Riverwalk. I can sit there and read or write for hours. One thing that always strikes my curiosity is a tree stump which appears to have been turned into somewhat of a seat out on the patch of land in the middle of the river. I’m not sure whether the tree stump seat is natural or man-made, but I’ve often wondered if anyone ever wades across the water to sit for a spell. Perhaps we might construct a fascinating legend for the old stump. Next time you are walking along the Riverwalk, drop by this landing and see how all of life’s worries can disappear for a short period of time. I welcome you to submit a comment below describing your favorite place to relax along the Riverwalk.